Have you recently bought some bamboo flooring and looking for the best underlayment? Did you know what lies underneath your bamboo plays an even more important role or equal to? Underlayment for bamboo can help you solve three hidden problems. From talking to customers who had questions, bamboo flooring seems to be more prone to moisture. 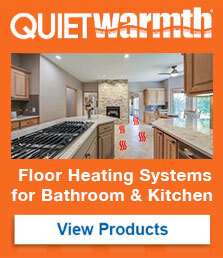 With QuietWalk Plus underlayment, it prohibits upto 5lbs of moisture per 24 hours. You can figure out the amount of pounds your subfloor is emitting by doing a calcium chloride test. Most flooring installers won’t do a test but they lay down a 6 mil vapor barrier on top of the subfloor and under the bamboo/underlayment. The vapor barrier provides complete protection of moisture. Another benefit is the fiber underlayment provides a fuller sound when walking on. Also dampens the sound from impact or sound transmission noises. We offer QuietWalk Plus underlayment for bamboo flooring that provides all three benefits above. Not only that, but it is a recycled fiber that allows no VOCs.